The Upgrade Place Blog | Technology News on Computer Memory, Storage Drives, and more. : Share your Photos and Video's Instantly and Effortlessly! Share your Photos and Video's Instantly and Effortlessly! Stream photos and videos to portable devices without the hassle of using cables, card readers or a computer. Transcends NEW Wi-Fi SD card allows you to share your photos and videos from your camera, to your smartphone or tablet as soon as you take them. 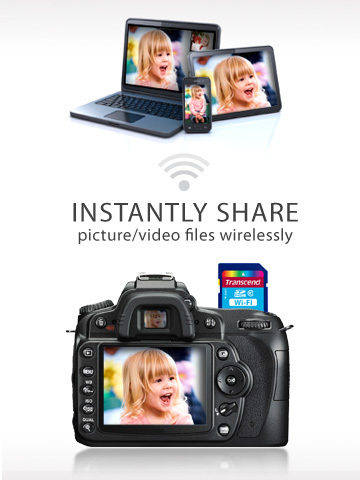 The Wi-Fi SD card instantly adds wireless capability to an SDHC compatible digital camera. With the free to download Wi-Fi SD app, you can capture pictures on your camera and download them to your iOS and Android device quickly and easily. The Wi-Fi SD app allows you to switch to internet mode, connect to a Wi-Fi hotspot or your smartphone or tablet, then download photos from the card and email to friends or upload photos to social networking websites. 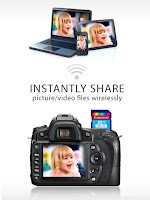 Direct Share mode activates the Wi-Fi SD card’s own dedicated wireless signal to create peer-to-peer connections between the Wi-Fi SD card and your mobile device. Direct Share allows you to share your whole collection with up to three devices wherever you go. Featuring the SDHC Class 10 speed rating, Transcend Wi-Fi SD cards provide high transfer speeds and excellent performance. 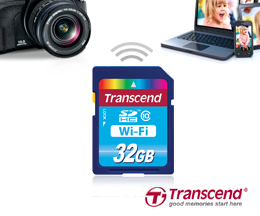 The Wi-Fi SD card provides plenty of space and support for extremely high-resolution pictures. The Upgrade Place has a wide range of compact flash to suit any photography need. For information on Flash Memory, Hard Drives, SSD's or other upgrade products call us at 800.338.1531 or email sales@theupgradeplace.com.